Grab a pen and join us for this popular, lively workshop—it’s spiced with stories and tips to empower and inspire writers of all levels. 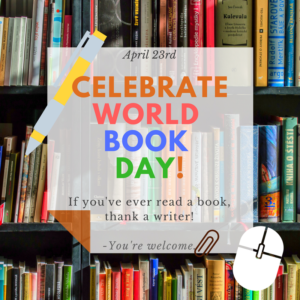 We’ll start with a glance at today’s dynamic book business (including the rise of self-publishing), then share tips for connecting with editors and literary agents, as well as ideas to help writers both refine their craft and stretch their creativity, and wrap up with a few practical thoughts on book promotion. Other highlights: Writing prompts to stir fresh thinking; four-page handout; Q&A, sample edit. How much: $20 per person — reservations are not needed. All walk-ins are welcome! 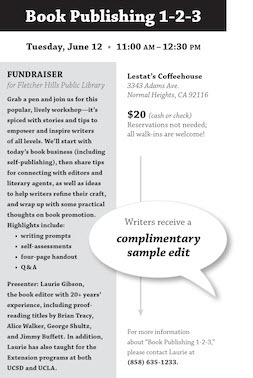 Benefit: Half of the proceeds will be donated to the Fletcher Hills Public Library. Presenter: Laurie Gibson, the book editor with more than two decades of professional experience, including proofreading titles by Brian Tracy, Alice Walker, George Shultz, and Jimmy Buffett. 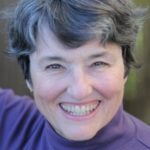 For several years, Laurie also taught editing for the Extension programs at both UCSD and UCLA. Please note, this event and the one in July will be the last time Book Publishing 1-2-3 will be presented in the region! Join Write Out Loud and San Diego Public Library for a delightful evening of live readings and performance of the top 4 winning stories in SDPL’s inaugural Short Story Contest. The goal of the Short Story Contest is to foster local writing talent and provide a platform for the promotion and publication of short-form fiction in the area and is a continuation of the library’s robust support for local writing. Winning writers Aaron Garretson, Jean Seager, Bruce Golden and Eleanor Bluestein will be in attendance to receive their awards. Refreshments served. Margaret Harmon spoke at the La Jolla Pen Women get together this past weekend about “Literary Games, using the power of PLAY to crash through fears, blocks, and procrastination…we win by playing.” Harmon won the 2014 San Diego Book Award for Best Published Anthology with The Genie Who Had Wishes of His Own. She also spent some time at the San Diego Writers and Editors Guild Author Showcase in the La Jolla Library on Saturday, May 11th. This is the reason SDBA is here, to celebrate San Diego writing, writers, and happenings. 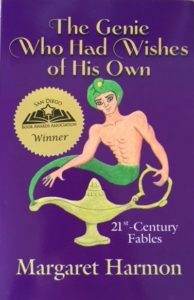 San Diego Book Awards regrets to announce the cancellation of this year’s published book competition. Unfortunately, we did not receive enough entries to have a meaningful competition. The unpublished segment of the competition will go on as planned. We have contacted our published authors, and most have opted to leave their entries with us. They will be automatically entered in next year’s competition. We are considering making this a two-year competition moving forward. Although the competition has been modified for 2018, we still have a number of activities planned for the coming months, and there are many ways to get involved and volunteer to help us continue our mission of encouraging and supporting local authors. THE 2018 WINDOW FOR PUBLISHED AND UNPUBLISHED SUBMISSIONS IS NOW CLOSED. BEST OF LUCK TO ALL ENTRANTS! A special note of thanks goes out to all judges and judging chairs during this time. 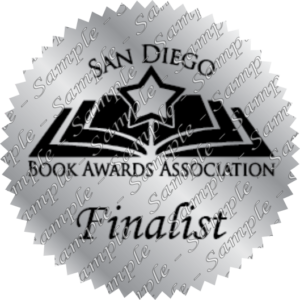 2018 San Diego Book Awards! Entry fee for each Published submission is $25.00. The San Diego Book Awards Published Book competition is open to current residents of San Diego County. Books submitted for the 2017 competition (awards presented in June 2018) must have been first published or copyrighted in 2017. The submission period for published books will begin on January 1, 2018, and end on January 31, 2018. Entries postmarked after January 31 will not be judged. Categories (and their subcategories) are listed on the entry form. The final categories and the number of finalists each year is dependent on the number of entries. A book may be entered only once–in either the published year or copyright year. All submissions remain the literary property of the writer. Incomplete entries or entries received after the deadline will not be judged. Submissions received with postage due will be discarded, not judged. 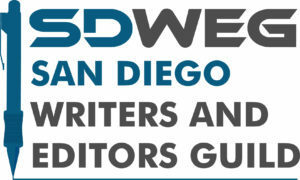 Send complete entries to San Diego Book Awards, P.O. Box 6487, Oceanside, CA 92052-6487. For additional information, please see our GUIDELINES. To celebrate the end of 2017, we at SDBA are honored to now have stickers available for those who have entered and become finalists. As a special thank you for those who have submitted so bravely in previous years, this is our way of letting you know your hard work and support have not gone unnoticed. Stickers are available for purchase in the SDBA store! San Diego Book Awards Association is a 501(c)(3) nonprofit organization and we gladly accept your tax-deductible donations!